Story Time--The Most Important 10 Minutes in a Child's Day! Your children or grandchildren will delight in this fully-illustrated storybook that brings 365 read-aloud classic Bible stories to life for impressionable young hearts. Beginning with the creation story, "God Creates the Earth," and ending with "In Eternity with God,” your children will develop faith in an almighty God who is the same yesterday, today, and forever, while journeying alongside Bible characters like Samuel, Jonah, Esther, David, John the Baptist, Mary, Joseph, and many more. 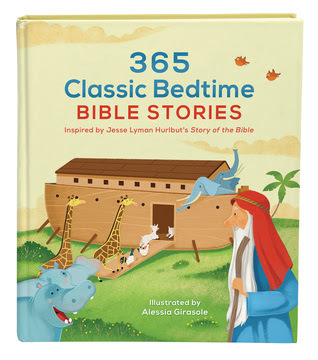 365 Classic Bedtime Bible Stories promises to make bedtime reading a delightful learning and faith-building experience for your kids 3 and up. This is a great book to read to children! I appreciated that there are lesser-known stories included, and I feel like reading one or two stories each day will give children a deeper knowledge of the entirety of the Bible. The illustrations are simple and colorful, perfect for younger children. Each page is a summary of a story in the Bible, and while they are portrayed in an age-appropriate manner, I wish that the quotes from what the people said were not put into a modern day narrative, but the actual words spoken from the King James version of the Bible. I think it is important for children to get used to the language of the Bible for when they begin to read it on their own. Overall this is a valuable resource for developing a love of the scriptures in children. There is even a ribbon bookmark attached to hold your place!